Entrepreneur Moishe Mana has unveiled new eye-popping animated renderings of his massive Wynwood redevelopment as he drums up investment and international interest in his plan for a trade center linking Latin America with China and other parts of Asia. The conceptual images, by far the most detailed Mana and his architects have issued, depict a dense cluster of irregularly spaced towers that would house offices, showrooms, hotels and a conference facility on the western portion of his extensive Wynwood holdings. The trade center would occupy the 8.5 acres of Mana’s property stretching west of Northwest Fifth Avenue to Interstate 95. A special zoning and development plan, approved by the Miami Commission in September, allows Mana significantly greater height and density there than what is permitted in the surrounding, low-scale Wynwood warehouse district. The new renderings, based on designs by Miami’s Zyscovich Architects, also provide a fresh, fuller look at the project’s less-intensive eastern section, a 15-acre expanse facing Wynwood’s main street, Northwest Second Avenue. Mana, who has developed a comprehensive art center in a set of former industrial buildings in Jersey City, New Jersey, has promised a series of cultural and art-focused facilities hugging an elongated public plaza he has dubbed Mana Commons. Full development of the cultural piece, though, is taking a back seat for now to the trade center concept, though Mana is obligated by the city agreement to build the public space early on. Mana decided to go all-in on the trade center idea after receiving significant interest from China, said Theodore Ward, a partner in Novam Portam, a consulting group that’s helping the developer work up a strategic vision. The firm is also helping Mana reach out to potential tenants in Asia to test its viability. Mana, who is known for adapting old buildings to new uses but has not built much from scratch, is in addition looking for development partners, Ward said. As a result of his new commitment, Mana has dropped all plans to include high-rise residential in the Wynwood project, Ward said. The trade center is designed to capitalize on a growing Asian commercial interest in Latin America by linking up traders, producers, lawyers and investment groups from each continent physically in Miami, a natural connection point, Ward said. Trade between Asian and Latin American interests remains “fragmented” and the Wynwood center would be ideally positioned to cement those relationships, he said. The Asian companies they’re trying to lure do not currently have a presence in South Florida, Ward added. Mana’s vision for Wynwood, which has shifted significantly as he has honed it, has been controversial because of its scale and intensity. Some neighborhood property owners and residents worry Mana’s project could overwhelm the old warehouse district’s ongoing transformation into an artsy entertainment, working and living area. 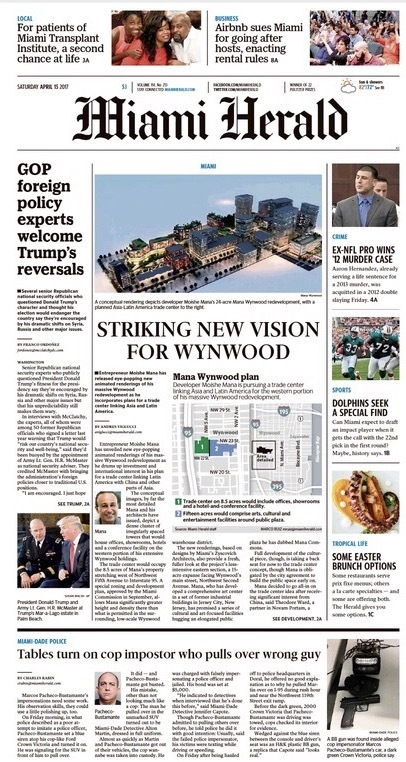 Mana’s team was enmeshed in prolonged and sometimes publicly contentious negotiations with the Wynwood Business Improvement District, a quasi-independent city agency that represents the neighborhood’s property owners, before winning approval for a special area plan under the city’s Miami 21 zoning code. The final plan is meant to ensure that the massive project meshes with the surrounding streets by pushing the higher intensity towards I-95 and away from the center of the neighborhood. Albert Garcia, the BID’s co-chair, said he expects Mana’s plans to continue to evolve, but that his latest concept appears to fit within the confines of the agreed-upon blueprint. “We’re obviously committed to responsible development, not only on his piece but throughout the entire district,” Garcia said. “We would obviously expect and assume everything he agreed to is what will end up happening there.